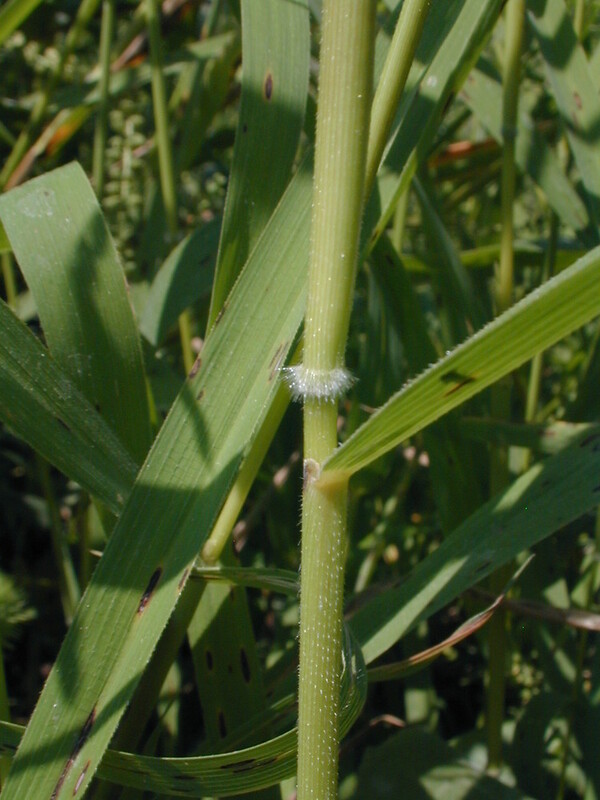 Leersia oryzoides. By Robert Vid_ki. Copyright © 2015 CC BY-NC 3.0. For Reuse- Contact Bugwood – www.bugwood.org.New England Wild Flower Society.gobotany.newenglandwild.org (Accessed 4/2015). 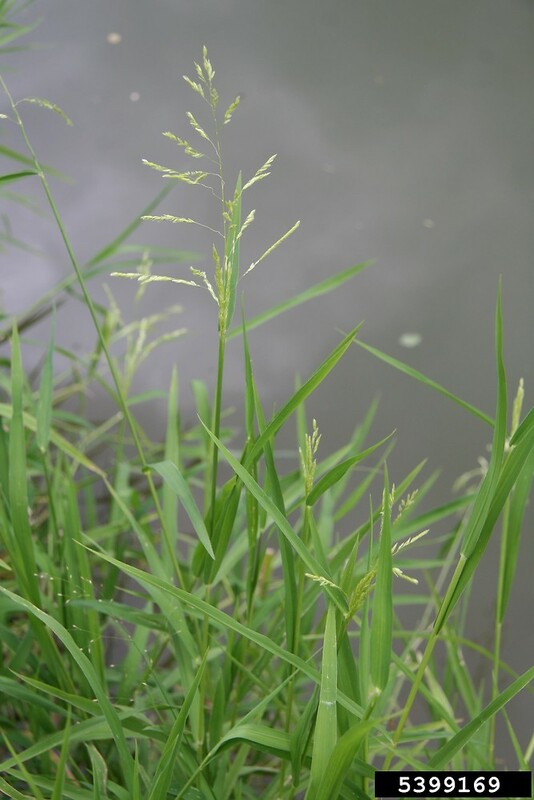 Leersia oryzoides is a perennial C3 grass (Reich et al. 2003), to 1.5 m, aggressively colonial by rhizomes, rooting at nodes; stems thin, reclining, sprawling, distally erect, freely branching. Leaves thin, bright green, main blades 15-30 cm long, 0.6-1.5 cm wide; sheaths and leaves very rough textured, raspy. Flower spikelets 1-flowered, 0.4-0.7 cm, overlapping in clusters at ends of branches, no glumes, lemma with wing-like keel, lemma and palea striped green and white; inflorescence pale, branched, slender, spreading or partially enclosed by sheath, 2-3 branches on lower nodes; blooming and fruiting July-Oct.
Leersia oryzoides.hairy node.© John Hilty.New England Wild Flower Society.gobotany.newenglandwild.org (Accessed 6/2014). Habitat: Open swamps, wet edges, gaps in wet woods, soil pH 5.1-8.8, tolerant of fire, intolerant of shade, salt, drought (USDA, NRCS 2010).